Halloween With Your Pets Can Be Sweet Too! I must admit, I’m one of those adults that love to still get dressed up on Halloween. I also look forward to dressing up my dog in a costume too! It’s not an easy task trying to find a costume for a 75lb boxer, but some how every year, I manage to do it. There’s nothing sweeter than watching the trick or treaters walk onto my porch, ring the doorbell and be greeted by myself as a witch or even a Hershey’s Kiss and then have my dog peek out between my legs and appear in costume as spider dog. I actually think the little ghosts and goblins in my neighborhood get a bigger kick out of my dog than the candy I give! I have read in many places that one in every 10 adults dress up their pets for Halloween. Here at Blair Candy our company is filled with many employees that have all kinds of pets, but dogs do prevail. We spend a lot of time reminding pet owners this time of year to be careful with those bags full of candy barsand Halloween candy treats. Remember they also smell and look just as good to your k9 friends. Your faithful friends aren’t as lucky as some of us who do over eat these chocolate treats. We may get a stomach ache or gain a few pounds, but these same sweet treats could be fatal for our dogs or cats. This Halloween season, we hope everyone gets bags and bags of all their favorite nostalgic candy treats. If you don’t want your spider dog to feel left out, I suggest getting them their own bag full of dog treats! Happy Safe Halloween To Everyone! There’s not a day that goes by this time of year that someone isn’t asking, “what’s the favorite Halloween Candy this year?” I usually start to answer with a giggle, and then explain even though there are many new candy treats made each year; the nostalgic candy treats are what they want and sells the most! Don’t think the new gummy earthworms or chocolate shaped body parts don’t sell or the Twirly Whirly orange and black Halloween lollipops either, because they do. Not near as much as fundip, giant pixy stixs , smarties and even regular size candy bars. I remember when I was running around the neighborhood painted up as a monster, or wrapped in toilet paper as a mummy, my eyes would light up when I saw someone throwing a full size Reese’s or Butterfinger in my pillowcase. Even better was my neighbor who would give us all a big pack of bubble gum. I often wonder what it would be like now to go trick or treating? 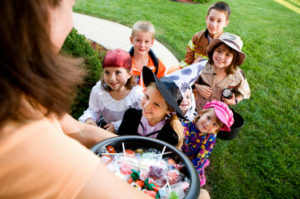 Oh I know, the candy’s still the same, but most cities don’t set Trick or Treat in the evenings, but instead have the kids running around in daylight. Yes, many things change in life, even Halloween traditions to a degree, but it doesn’t matter if your city makes you trick or treat during the day, or if they bag the door to door altogether and make the kids dash off to the mall or a park. Kids still get dressed up, and want to enjoy the good old standbys like I use to enjoy. I guess that’s why we still sell so many oldtime nostalgic candy favorites at Halloween!